The dress is super cute and quirky! Thanks, Mel and fonkychild. Quirky didn’t come to mind when I shot it, but I can see what you mean. I really like how Ai has repeated the mushroom theme in her dress with her necklace, and the color red with her ring. 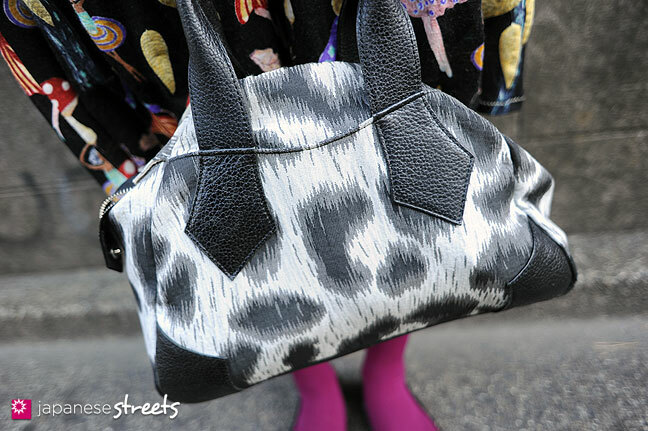 It’s this enormous attention to detail that I love about Japanese street fashion. i LOVE the mushrooms! and her hairstyle! really cool! 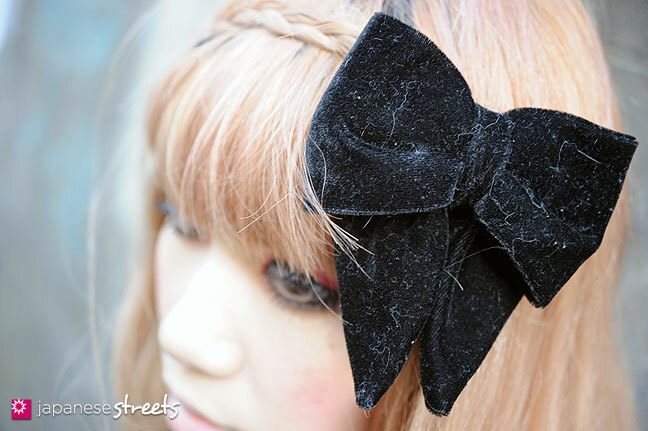 plus that bow, she’s really cute!!! lovely dress! + her hair! However, she has a very cute outfit on. @ojisanbaka: Oops, I should have taken a close-up of the watch! I also have a cat, but his hairs are very straight. Perhaps she keeps the bow with her other clothes instead of separate or in a container? @bubababy: I wondered about that, too, after I saw my photos. I use a very wide lens, so if I don’t go through my knees enough it quickly affects what people look like. That may have happened here. Let’s give Ai the benefit of the doubt! 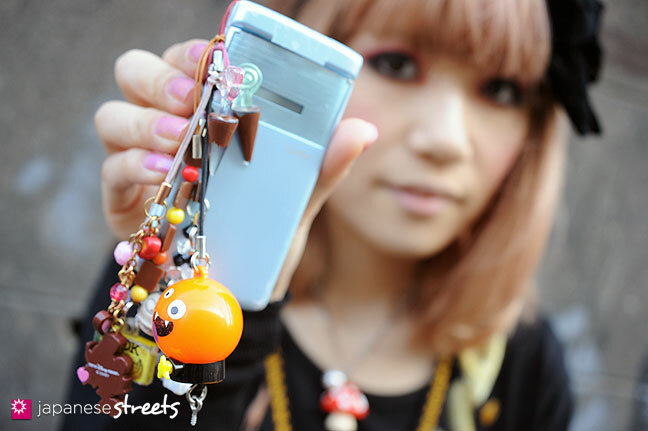 I love her hair and kinoko necklace too! I don’t like the Vivienne Westwood shoes though, they look so cheap. D: I don’t know why but I either love a VW creation to pieces or I think it looks awful. There’s nothing in between for me. The bag is cool but in my opinion it doesn’t fit her outfit at all. And if I’m not mistaken she’s also wearing a VW silver ring, right? :D I like that. @gionbaby: Like this mushroom dress, Chisato Tsumori creations are always very playful. And like you say, she is good with colors. I really her designs. 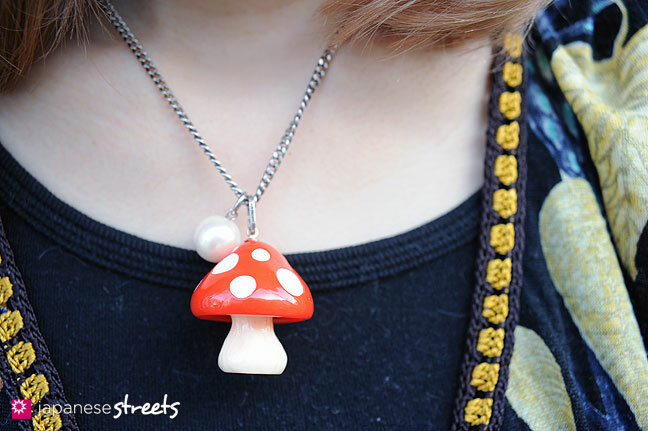 That and kinoko necklace is cool, eh! I think you’re right about the ring. And I agree with you on the shoes. I like them, but they cheapen the dress and the rest of the outfit. The design of those shoes would have looked great with this look if they had been made of leather or another quality material, don’t you think? @Kjeld Duits: I totally agree with you on the shoes. That material was a wrong choice. It would look way better if it would be made of leather. @gionbaby: Great observation on the make-up. You always notice the details well! @gionbaby: Yes, I noticed that, too. I am very glad that you appreciate the effort that we put into providing all the extra details (from close-ups to brand data and prices paid)! 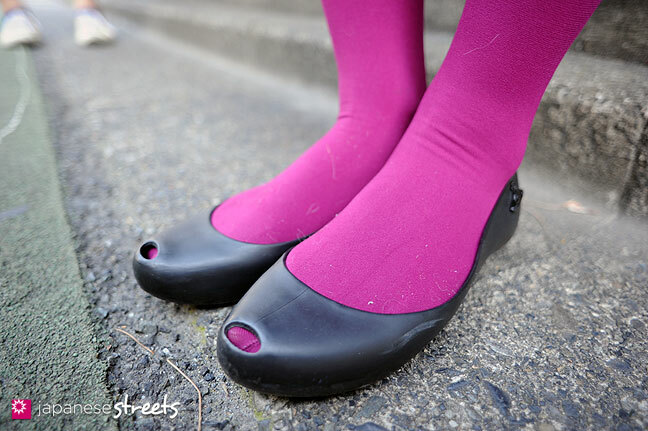 yearh, theres inspiration in all the photos at japanese streets! i’ll try using it when i go shopping at copenhagen. I really love your dress and your hair! And your tights are an awesome color! loving the mushroom dress, and the little accessories that match!